Advaita Acharya appeared in fifteenth century Bengal, India, as a teacher of Krishna consciousness. He is frequently mentioned in the biography of Chaitanya Mahaprabhu, Chaitanya Charitamrita, as an intimate associate of Chaitanya Mahaprabhu and as an avatar of Krishna (specifically an incarnation of Sadashiva and Maha-Vishnu). Chaitanya Charitamrita relates how Advaita Acharya was so pained to see the degraded condition of the people in Kali Yuga, the Age of Quarrel, that He fervently prayed for Krishna Himself to descend and remedy the situation. 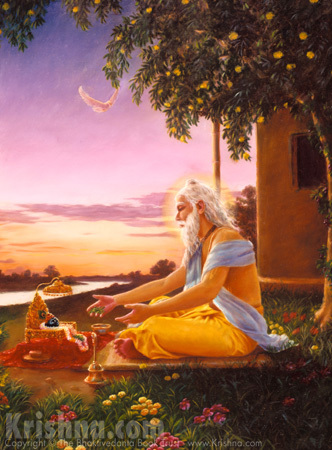 Sri Advaita worshiped Krishna on the banks of the Ganges with Ganges water and Tulasi leaves, crying out and begging for the Lord to come save the suffering souls. In response to Sri Adwaita Acharya's devotion and compassion, Krishna decided to appear, in the form of His own devotee—Chaitanya Mahaprabhu. Advaita Acharya was the first among Mahaprabhu's associates to appear within the material world. Some sixty years prior to Mahaprabhu's own advent, Advaita Acharya had already begun chanting Krishna's names in the streets with devotees and discussing scriptures on devotional service to Krishna. Advaita Acharya's name indicates that He is nondifferent—advaita—from Krishna, and spiritual master—acharya—because He taught devotional service to Krishna. Advaita Acharya lived in Shantipura and Mayapura, in what is now West Bengal, and was the head of the Vaishnava community of Nadia.